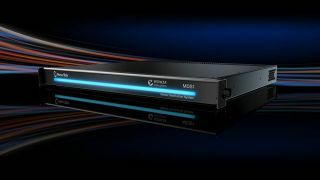 NewTek and Wowza Media Systems are now shipping the MediaDS, a real-time media encoding and live streaming video delivery system. MediaDS is a hardware and software solution merging NewTek’s industry-leading live production technology with Wowza streaming software in a 1RU footprint. The result is an end-to-end streaming solution that allows producers to launch their own multichannel content networks from their production site and deliver a live video stream directly to their viewers. For enhanced scalability, producers can also create a virtual CDN or edge network by connecting multiple MediaDS together—either through a local area network, or remotely over IP to cross wide geographic boundaries. MediaDS also allows organizations to extend their brand and exposure beyond actual video content. The system not only acts as a media server, but also will host all required content—including independently customizable web pages—for audience viewing, to ensure that the on-screen experience adheres to organizational brand guidelines. Embed codes are also available to insert the Wowza Player into existing webpages to complement current web presence. MediaDS helps ensure the optimal audiovisual experience for viewing audiences right from the system by introducing another layer of quality control into any signal flow. With support for dedicated multiviewer monitoring, a local operator can observe all video streams in real time or focus on a specific channel full-screen, and manage image and sound quality with integrated waveform and vectorscope displays, independent color correction tools, and multichannel audio level control available for every stream. Producers can also stack multiple channels from the same source, and encode them into different renditions as a grouped stream to enable adaptive bitrate streaming. MediaDS include a video player for each channel provided by locally hosted web pages, with support for external streaming to Facebook Live, Microsoft Azure, YouTube, Wowza CDN, Wowza Streaming Cloud, and custom RTMP configurations. It also features Integrated NDI technology, supporting live input and output over IP; NewTek’s real-time video and audio production tools; and four SDI inputs supporting up to 3G 1080p. MediaDS is available immediately for $11,995 U.S. MSRP.